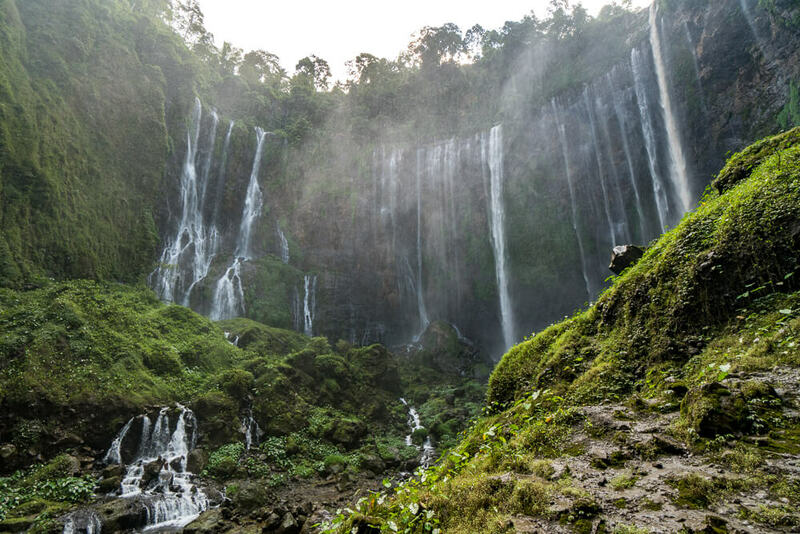 Tumpak Sewu waterfall, also known as Coban Sewu, is one of the most beautiful waterfalls in East Java, and even one of the best in all of Indonesia. Standing at 120 metres tall, this breathtaking waterfall powers down the side of a steep cliff face whilst surrounded by dense jungle. 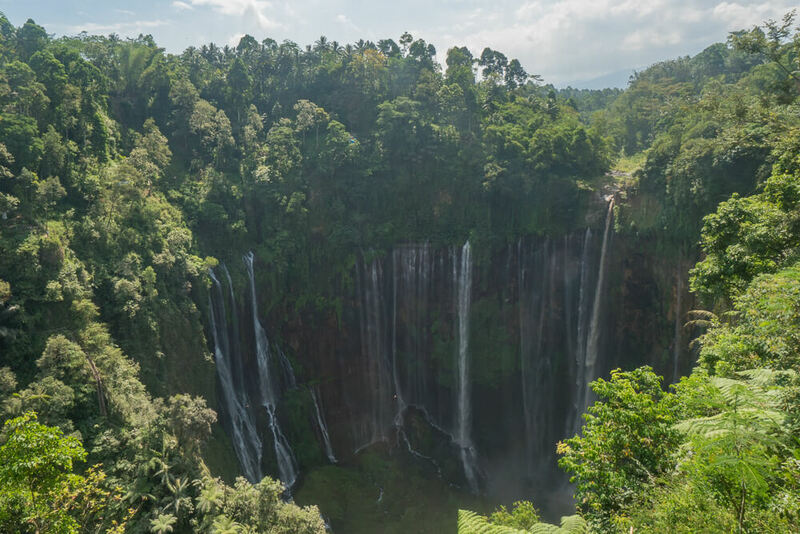 Although Tumpak Sewu is often overlooked in favour of visiting Mount Bromo and Kawah Ijen, it can easily be visited on a day trip from either Probolinggo or Malang. We’ve seen some amazing waterfalls on our travels, and this is unquestionably one of the best so we strongly recommend visiting as part of any Indonesia itinerary. 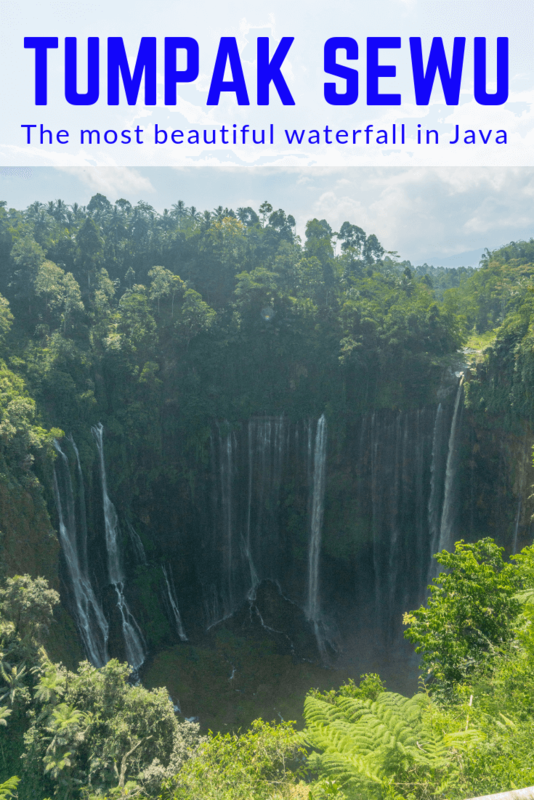 Find out everything you need to know about visiting with this guide to the magnificent Tumpak Sewu waterfalls. 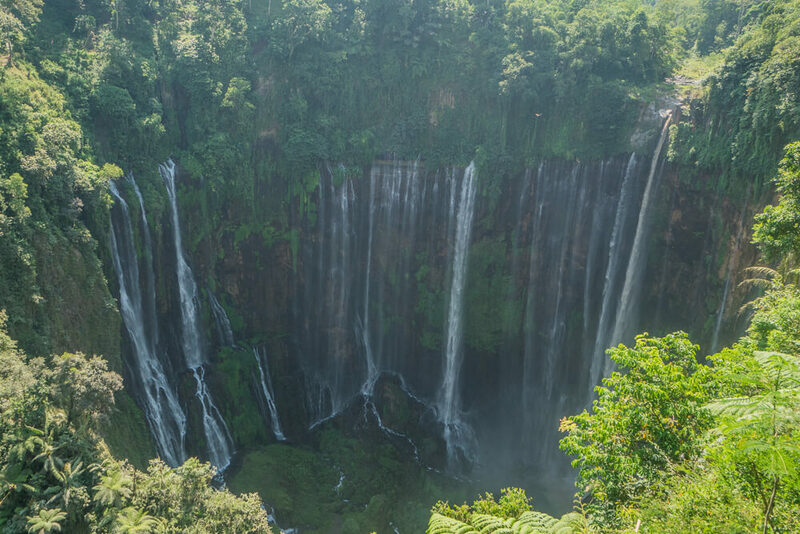 Tumpak Sewu waterfall entrance fee – 20,000 Rupiah per person. 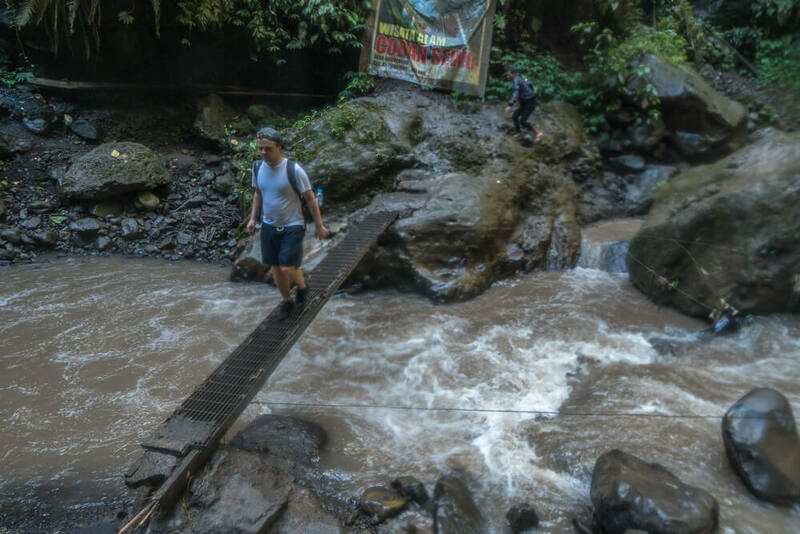 This may be charged in 2 sets of 10,000 Rupiah – we were charged 10,000 Rupiah at the entrance and 10,000 Rupiah at the base of the falls. Tumpak Sewu waterfall height – 120 metres. Tumpak Sewu waterfall is located in the Lumajang province of East Java, and is best visited from either Probolinggo or Malang. The waterfall is fairly remote and so it’s a long drive from either city. To visit Tumpak Sewu from Probolinggo you will need to organise a taxi/driver to take you. Drivers in Probolinggo mainly offer tours to Mount Bromo, so you may need to ask around a to find a driver that will take you to the waterfall. 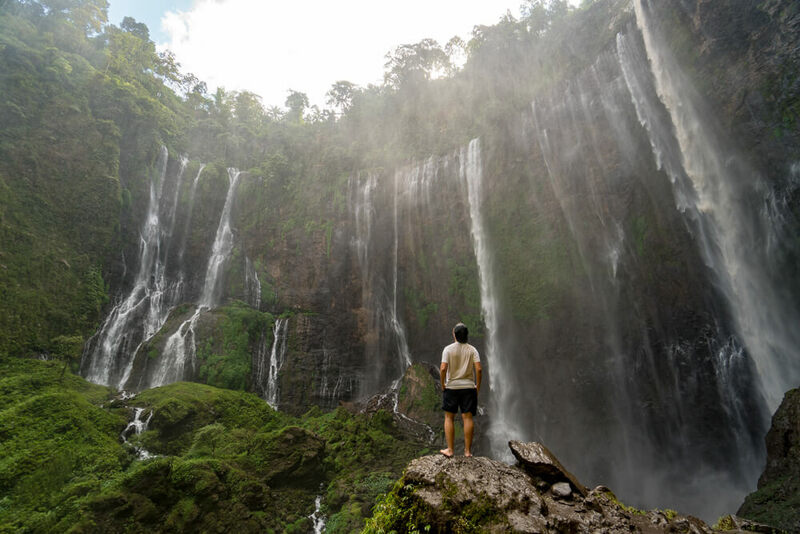 The owner at Colorbox hostel agreed a price of 500,000 Rupiah for a day tour to Tumpak Sewu waterfall. We split this cost between 3 of us, which made it was a fairly cheap day out! In total, the drive from Probolinggo takes around 3-4 hours. If you want to visit Tumpak Sewu from Malang you will also need to find a driver in the area. Be prepared to negotiate but realistically expect to pay around 500,000 Rupiah for a return trip. It takes around 2-3 hours to get there from Malang. Whether you decide to visit from Probolinggo or Malang it’s important to keep in mind that the estimated travel times from apps like Google Maps aren’t very reliable. It can be common to get stuck behind slow traffic, so it’s worth accounting for this extra time when planning your day. There are 2 entrances to Tumpak Sewu – the east entrance and the west entrance. We strongly recommend visiting from the east entrance as the walk to the falls is much better! East entrance to Tumpak Sewu waterfall – After arriving at the car park to the east entrance, follow the path downhill. After around 10 minutes you will arrive to a panoramic viewpoint with amazing views of the Tumpak Sewu waterfall. It’s a truly wonderful sight, so take your time to enjoy it. When we visited there were only a few other tourists there due to the remote location of the waterfall! To reach the base of the waterfall you need to take a steep path down, which takes around 45-60 minutes. Be warned though, it’s a tough walk and certainly not for the faint hearted! West entrance to Tumpak Sewu waterfall – The alternative to the above route is to visit from the west entrance to the waterfall. In our opinion, the path from the west entrance is far worse than the one at the east entrance. The path pretty much consists of a series of bamboo ladders down the side of a cliff. Although we didn’t try it ourselves, our driver had done it a few weeks earlier and said it didn’t feel safe at all. For that reason, we strongly recommend visiting via the east entrance if you want to climb down to the base of the waterfall! The best time to visit is between April and October as this is the dry season. 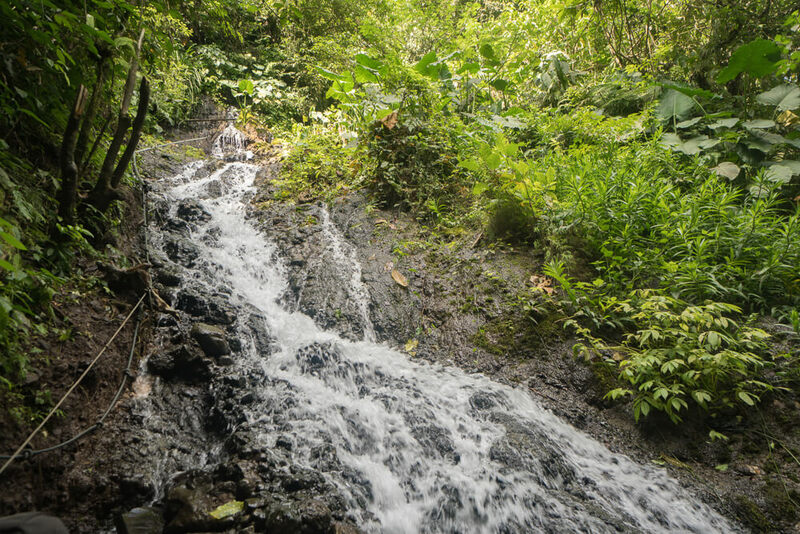 If you visit during the rainy season the path down to the waterfall can be very slippery and dangerous. The current in the river will also be stronger, making it harder to cross. For this reason, we recommend you try and visit between April and October if you plan on climbing down to the base of the falls. As Tumpak Sewu is located in the rainforest/jungle, bursts of rain are still possible during the dry season. If it has been raining when you visit make sure to take extra care on your way down. Allow extra time to account for this or, if possible, visit on a different day. Due to the remote location of the waterfall there are often only a few other tourists around. When we visited there were about 5 other tourists at the viewpoint and we were the only ones to make our way to the base of the falls. It’s best to arrive to Tumpak Sewu waterfall as early as possible though to spend as much time as you can at this incredible place! Goa Tetes –Goa Tetes is a series of caves and waterfalls just a short distance from Tumpak Sewu waterfall. If you retrace your steps and follow the river along from the base of Tumpak Sewu you will find signs leading to Goa Tetes. The signs claim it is about 100 metres away but after about 10 minutes we hadn’t got there and so we had to turn back as it was getting dark. If you do make it to Goa Tetes there are a number of caves to climb to and explore so you’ll need to allow for extra time if you want to fit this into your day trip! It’s a long day –Regardless of whether you visit from Probolinggo or Malang, it’s a very long day out. It takes about an hour down to the base of the falls and then an hour back up, so once you factor in the driving time of up to 4 hours each way it really adds up. That being said, it’s completely worth the effort to visit this incredible place! Take a waterproof bag – There is a lot of spray at the base of the waterfall so it’s well worth taking a waterproof bag to keep your things dry. As soon as you get close you’re going to get pretty wet, so it’s best to keep your valuables safe and dry! Bring suitable footwear – As the walk down is pretty tough it’s important to bring comfortable footwear with a good grip. If your shoes aren’t suitable for walking in water your best bet is to go barefoot when climbing down the waterfall and crossing the river. Ideally you’ll want to put your shoes in a waterproof bag to keep them dry! Bring food and water – When we visited there weren’t any warungs in the immediate area surrounding the waterfall. There are some small warungs in the villages leading up to the falls, but we’d still recommend bringing your own food and water in case these aren’t open or don’t have anything you fancy! 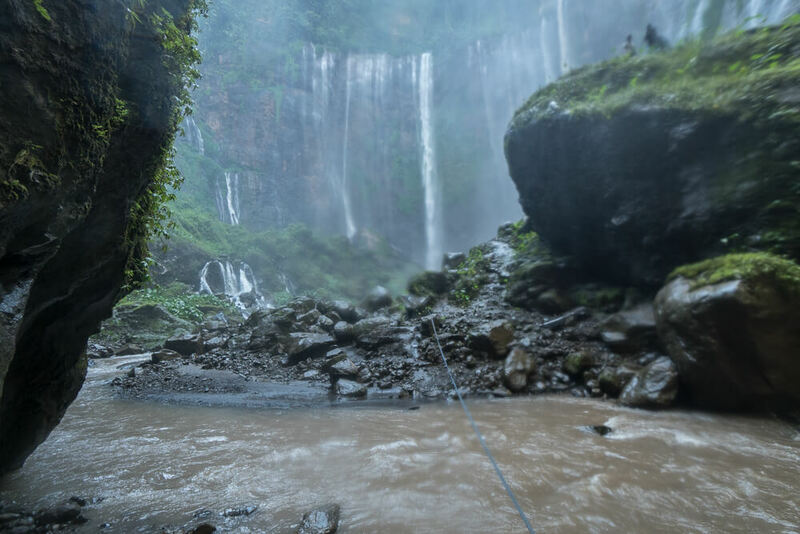 Guides – If you want a guide to take you to the base of Tumpak Sewu waterfall it should cost around 100,000 Rupiah. Guides to the waterfall are found near the entrance and panoramic viewpoint and may try to overcharge so be prepared to negotiate. Although the path is fairly challenging, we were able to do it without a guide and it was always obvious which way to go. If you’re not the most confident though it’s probably worthwhile paying the extra for a guide, as it’s a fairly reasonable price. Make sure to tip your guide too if they show you a good time! Have a rest day before/after Bromo – If you’re planning on hiking at places like Mount Bromo and Kawah Ijen then it’s important to plan some rest days. We did Bromo, Ijen and Tumpak Sewu in the space of 4 days and it was extremely tough work. Our legs were extremely sore by the end of it, so it’s important to plan a couple of rest days in between if you have time! 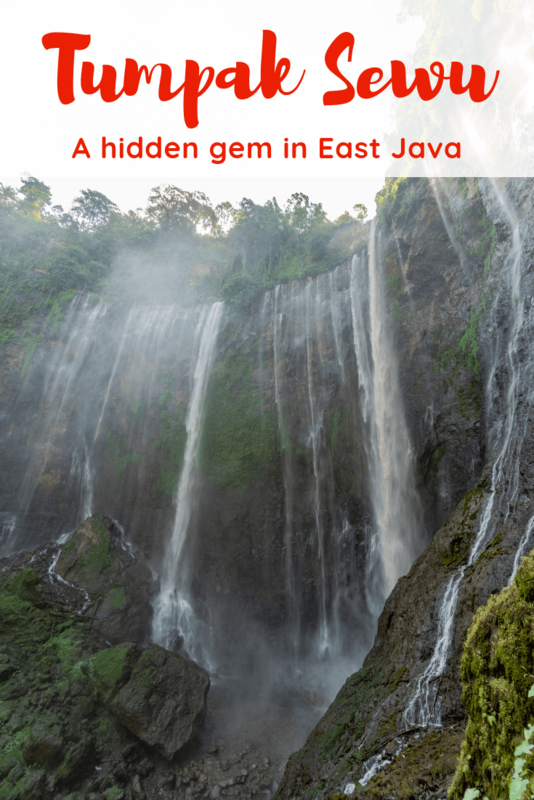 Like this guide to Tumpak Sewu Waterfall? Pin it!